LionSales is a browser add-on that shows commercial and non-commercial offers so that you can find the best deals and save money. LionSales does not own those offers and accepts no responsibility for their content because every pop-up offer is owned by a certain third party. As a result, you interact with LionSales pop-ups at your own risk. Our advice is to remove LionSales from the browsers because the browser add-on may provide you with deceptive offers. LionSales was built using the JustPlugIt browser add-on creation engine, which was used to create RoyalCoupon, RightCoupon, and many other browser add-ons. 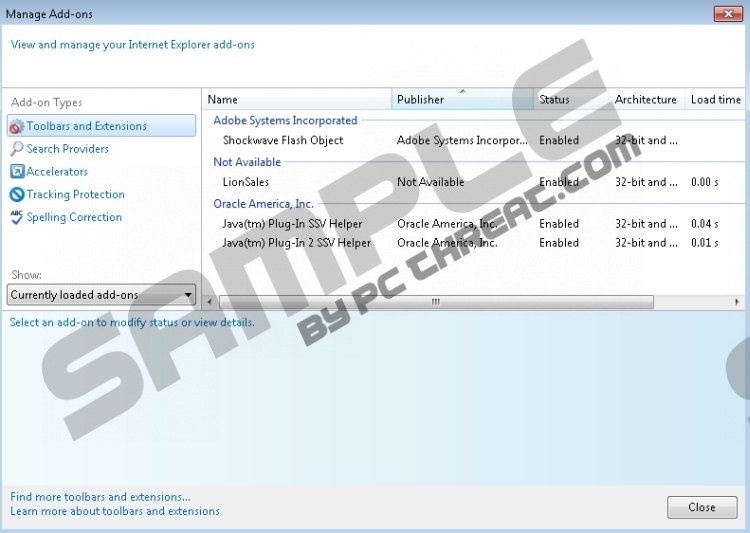 JustPlugIt-based browser add-ons, including LionSales, are categorized as adware because all of them display third-party pop-ups, some of which offer the user unreliable services and products. The LionSales program is compatible with Internet Explorer and Mozilla Firefox and is promoted at linsales.info; however, the website does feature the installer of the program, which suggests that the so-called official website is just an attempt to convince you that LionSales is reliable. The truth is that the official website does not prove that the program you want to install is legitimate. LionSales should be removed from the computer, and you should not delay the removal of that program. LionSales accompanies you on basically every website you access. It records your clicks, impressions, search terms, browsing history, and other non-personally identifiable information for the purpose of determining your browsing patterns and providing you with new matching advertisements. However, it is important to point out that LionSales displays a lot of irrelevant advertisements, including web banner, interstitial advertisements, and pop-ups. You may be invited to play online games, take part in a survey or quiz, install a software program, etc. You should ignore such offers because advertisements promoting software may be related to malware distribution websites, whereas websites offering online quizzes may be aimed at obtaining your personal details or making you subscribe to some online services. If you want to browse the Internet as usual, you should not wait any longer. It is possible to uninstall LionSales, but we recommend that you remove LionSales using a reputable security program such as SpyHunter. This real-time security program can easily eliminate LionSales and many other threats, including Trojan horses, browser hijackers, adware programs, ransomware infections, and many other threats. In case you have any questions concerning the removal of LionSales or the use of the recommend anti-spyware program, feel free to leave a comment below in the comment box. Remove the LionSales adware program. If you want to be sure that you have fully removed LionSales from the PC, click the download button to get a free scanner. If necessary, invest in the program to have malicious files removed. Quick & tested solution for LionSales removal.